Does your To-Be-Read list seem unending? Do you ‘know’ you should read but can’t get around to it? Did you read as a child but now can’t seem to find the time? 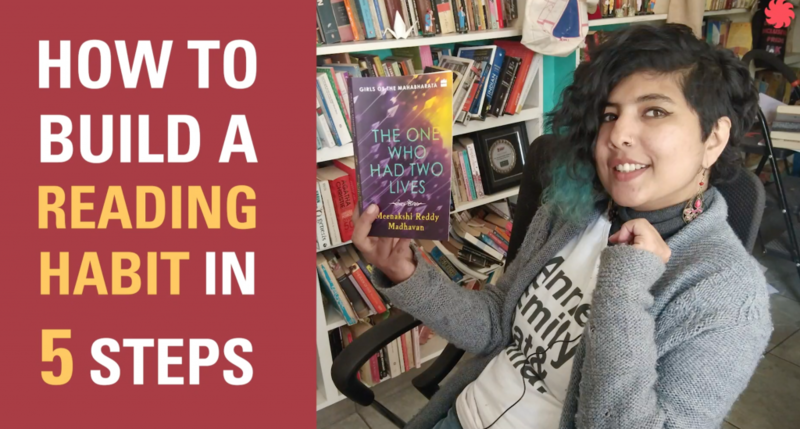 We got together with Meenakshi Reddy Madhavan, the author of several books, the latest one being The One Who Swam With the Fishes, where she talks to us about how she managed to read 175 books in one year! Then you want to start diversifying yourself a little bit. So for example, you like detective fiction. You’ve been reading murder mysteries, by this time you can tell ‘who did it’ by page 50 or something. Then start looking around. Google what are the best murder mysteries in the world. This is the ‘domino effect’ of books. You’ll notice that books have a kind of ‘Domino Effect’. So one book will start influencing another book. Say you start reading a book about a fictional author’s life. Say Possession by AS Byatt. And you say I’m really interested in what is happening in the background. I’m going to start looking at books that deal with that background. You’ll notice that each book that sparks something in you will lead to a cluster of books around it. Almost like a pod. It flowers out to reveal other books that you can read within the area. I think I trained myself to read fast when I was a kid. A lot of people say ‘isn’t it skimming?’ No, I think I retain quite a lot from what I am reading if not all of it. I get a sense of the atmosphere the writer is trying to convey but I’m also skipping ahead to the action. So I’m not getting mired down by detail. So what I encourage you to skip the bits that are boring. Look for any dialogue or key points that might come up later and skim skim skim skim. That brings me to abandoning books. If you don’t like something you’re reading, ditch it. There is no shame in ditching a book. Just get rid of it. I don’t want to read anymore, it’s not for me. A good way to clock all these books on Goodreads is also to see what kind of genres you’re reading that year. Some years I am very into historical fiction, some years fantasy. Last year, I was researching a crime novel which I’m writing right now. Read all the time. I read constantly. Every time I have a break, I read. I watch a lot of television and have a lot of stuff to do yet in the cracks of my time I read. When I’m on a flight, travelling, when I’m waiting for a friend at the restaurant I have a book in my bag so I can read, before i go to bed, I read. The only way to build a reading habit, is reading. On the go? Read on the app now!